How not to wrestle an alligator. Previous post: Sea Lions, Finbacks and Glaciers, Oh My! Next post: The peaks were close enough to reach out and do chinups on. I was raised on a 75-foot fish tender in the Gulf of Alaska. In port, at low tide, it was a forty-two foot climb up an often ice-encrusted ladder to get to the library, but if you’re a born reader and an icy climb is the only way you can get to the library, you climb. The Seldovia Public Library was one room in the basement of city hall. It was open once a week, on Monday nights, for three hours, seven to ten. Because there were so few books, each patron could check out only four at a time. Susan the librarian started me on Nancy Drew. I read all the Nancy Drew Susan had in short order, and then I read everything else on her shelves. Because I was a kid on a boat, I was always looking for stories about other kids on boats. Eventually, Susan found me a copy of The Lion’s Paw by Robb White. It’s World War II. 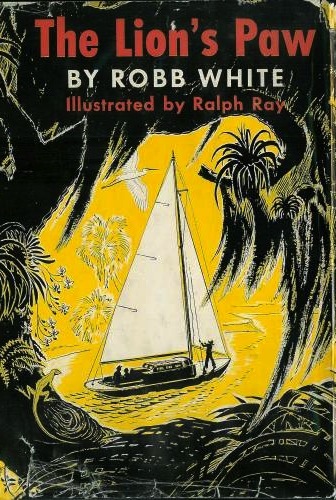 Fifteen-year old Ben’s father is lost at sea in the Pacific. Penny and Nick are siblings on the lam from the orphanage that would split them up. They stow away in Ben’s sailboat, the Hard A Lee. Ben’s uncle is going to sell it, so Ben, Penny and Nick decide to run away on the Hard A Lee together. My favorite kind of book is a how-to book. You can’t put enough detail into a book about how someone lives their life or does their job or falls in love or commits a crime to suit me. The Lion’s Paw is a how-to book. How to run away. How to sail a boat. How to be a captain. How to be crew. How to hide a sailboat in plain sight. How not to wrestle an alligator. How to go on a quest. He did, and I read it all. And then I started writing my own. And it is finally again in print. Buy it here. I promise you won’t be sorry. Midwesterners. We’re always on about the flooding. I once read myself through a library. It took a whole school year. I was bored to tears with 7th grade. The other students complained that I was always reading instead of listening. The teacher called my name and asked if I could spell bathysphere. I did. He asked me what it was and I told him. After that everyone let me read in peace. What a great story, Marilynne, thank you! I fell in love with The Lion’s Paw when I read it one summer when I was in fourth grade. I grew up in rural Michigan, had a 5 book once a week limit on books (because we only went to town once a week) and I had already read everything on the shelves, even the books my parents kept hidden. I read it until the covers fell off. I am so glad it is available again!